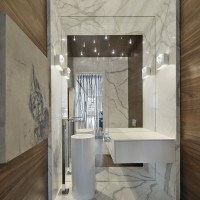 Cecconi Simone have designed the interior of a penthouse apartment in Toronto, Canada. This 4300 s.f. contemporary penthouse by Cecconi Simone occupies an entire level in a new, hi-rise condominium in Yorkville, Downtown Toronto. In line with current social trends, the clients – husband and wife empty-nesters – have downsized from a large, 1950s-era suburban home, opting instead for a more urban, less car-dependent lifestyle. The penthouse space, initially a raw shell, save for the placement of the plumbing, presented an exceptional opportunity to create a living environment tailored perfectly to the clients’ needs. 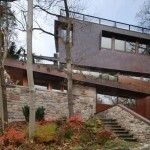 To that end, a modern, urban home has been crafted, with a clean design aesthetic in a palette of warm finishes. The residence is organized into a semi-open-plan, with fluid yet distinct public and private zones. Numerous occasions for displaying art are incorporated throughout. In the private elevator lobby, separating the public and private areas of the residence, a lowered ceiling and curtain treatment, concealing mechanicals and building services, produce a compressed and softened introductory space. 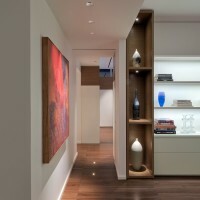 This enhances the sense of expansion and polished precision upon entry into the rest of the penthouse. In the public zone, the gallery-passage adjoining the living area is clad in white glazing panels, providing a neutral backdrop for artwork and creating an engaging contrast to the walnut floor tiles. A specially-commissioned screen, by Toronto-artist Ken Gangbar, delineates the gallery-passage and living area without hindering views. In the expansive living area, a custom, double-sided fireplace separates a larger gathering space from a smaller conversation space. Generous window openings and white-painted wall surfaces frame city views and receive works of art. The adjacent, open-plan dining–kitchen–den area, flooded with natural light from successive, near floor-to-ceiling windows, is designed for casual, family get-togethers and catered meals for friends and guests. An extended counter island accommodates buffet and cocktail-style events. During food preparation, the cooking area may be separated from the dining, den and living areas with sliding, glass, pocket partitions. Integrated and built-in appliances and custom millwork with invisible hardware eliminate visual clutter. 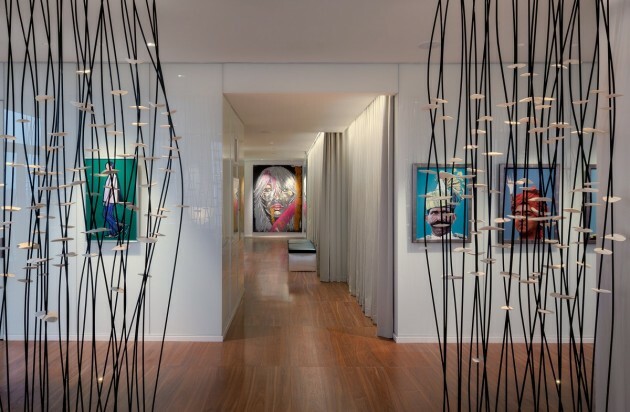 In the private zone of the residence, the master suite embraces an art-display area, sleep area, and his and hers ensuites with dressing area. His ensuite, with back entry, is isolated acoustically from the sleep area to ensure quiet during early-morning grooming and dressing. Her dressing area includes a small work space, gathering paperwork from more visible parts of the residence. 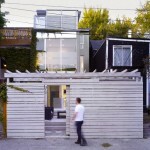 In her ensuite, the tub at the windows is raised on a platform to accommodate plumbing. Generated by practical need, the plinth enhances the tub as the focal point of the space.